For the first time in the history of the renowned San Francisco World Spirits Competition (SFSC) a German herbal liqueur won Gold. VEGEFEUER received the desiredaward in the category herbal liqueurs. 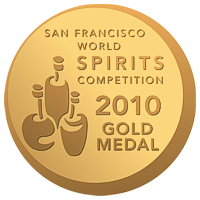 The San Francisco World Spirits Competition (SFSC) has been held since 2000 by Anthony Dias Blue and is considered to be one of the most prestigious competitions worldwide for spirits and liqueurs. The Judging Panel is composed by experts from the spirit and hotel sector, globally recognised mixologists, consultants and specialized journalists. Submitted brands are rated in a multilevel blind tasting. 1024 different liqueurs and spirits from 57 countries participated this year.